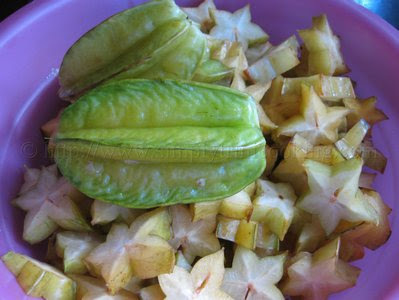 The tradition of producing preserved fruit, like this preserved five finger, has been a time honoured tradition here in Trinidad and Tobago. 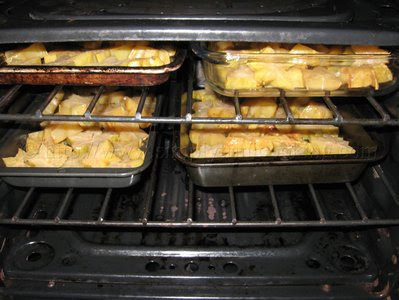 The fruits used may vary depending on what type of preserving you’re going to do. 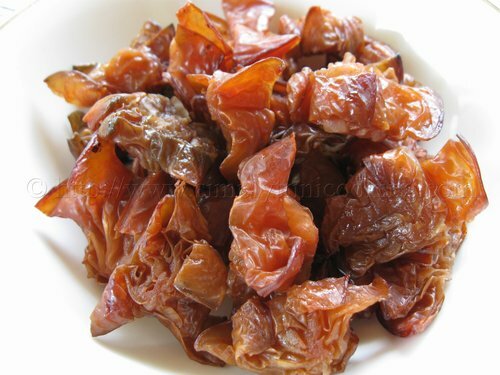 For the hot spicy preserved fruit we use the more “half ripe” fruits so you get a bit of sour together with the garlic infused brine you’re going to soak the fruit. This type of preserving we call “soaking”. So with lots of “half ripe” sour fruits to choose from on the island, the possibilities are endless. 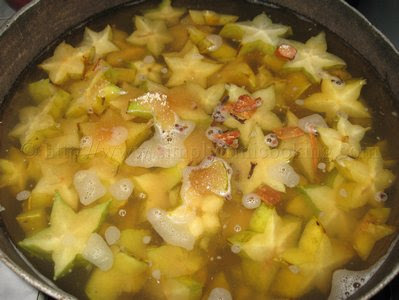 And you can also add the red colouring to the brine to give it that beautiful red colour we all know since our Primary school days. That’s how we get the famous red mango and red plum from. 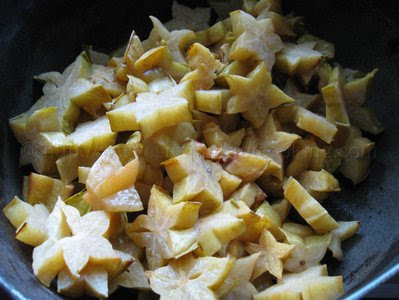 On the other side of the scale we have the sweet treatment to preserving using ripe fruits . But that process also has its variations with or without red colouring. 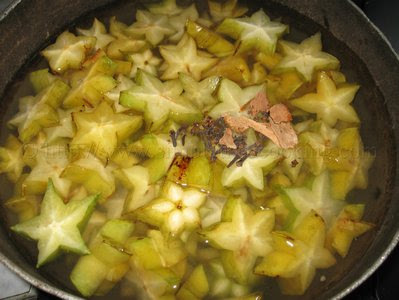 The first method is to boil the fruits in water with sugar and spices like clove and spice bark, until a thick syrup is formed…delicious! 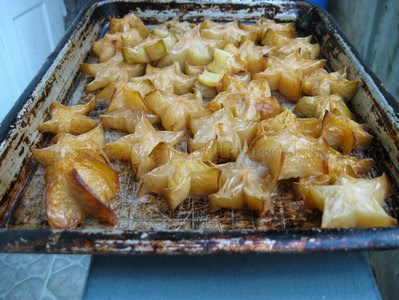 Then the other method involves the previous steps but instead of reducing to a syrup, you put the fruits in the sun to dry. 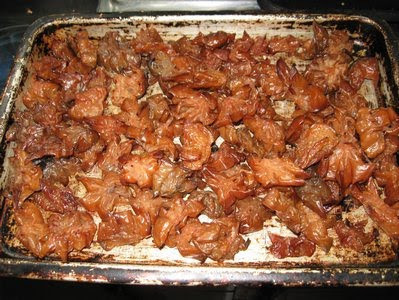 That is the one I’ll be showing you: the sun dried candied fruit. Of course with so much Five Finger around these days we decided to use it for the process. The process is simple and straightforward. 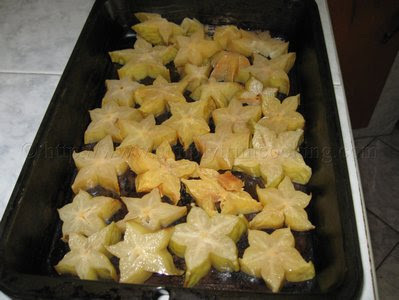 The only problem for my international readers, would be getting lots of hot sun to dry the fruit but we found that the oven also does a great job. Have fun making these preserved five finger. They’re sweet and very addictive. 🙂 Enjoy. Add to a large pot and pour enough water to cover the five finger. 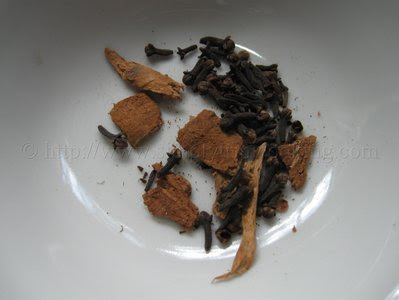 Add the clove and spice. Note:This time is important. You are allowing the five finger to soak up the sugar and spices. Here we have it drying in the sun. We decided to use the oven method since the sunlight wasn’t consistent. open a few inches to allow steam to escape. 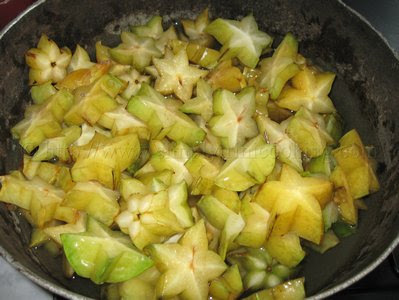 Check every hour and turn the fruit until done. See you soon with another recipe. Bye! Don’t forget to leave your comment about preserved five finger in the comment box below. 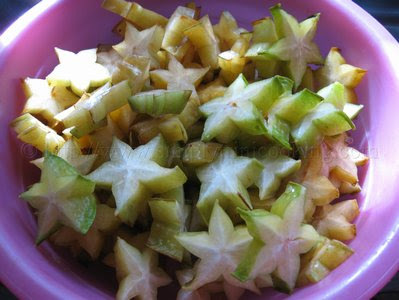 Candied star fruit was something I ate a lot when I was still a kid. Didn’t know that they can be made at home…. :-) Cool! Ok Carrie will do. I believe the pommecythere tree still has some fruit. i dont have brown sugar…shame thing with that, but i have white..can i use the white instead?